The illustrious career of Vassar's first professor of art and art history, Henry Van Ingen, began on Vassar’s opening day and lasted for thirty years until his death. Born in Holland on November 12, 1833, Van Ingen studied at the Academy of Design at The Hague, specializing in landscape painting. After his arrival in the United States in 1861, he taught at the University of Rochester, a Baptist institution chartered in 1850 whose founding president, Dr. Martin Anderson, was one of Vassar’s founding trustees. Matthew Vassar was also a trustee of the University of Rochester, and it is likely that Van Ingen joined the first Vassar faculty through these connections. For a time the only member of the art faculty, Van Ingen was a dedicated and passionate influence on the college. In Letters from Old-Time Vassar, Elba Huffman Bouslog, a special student in 1869-70, described him as a "burly Dutchman reared within sound of Antwerp chimes- [He] has a homely, kindly face and very approachable manners, but stands no nonsense." Upon his arrival at Vassar, Van Ingen was placed in charge of the School of Art, a separate entity within the college (See School of Art & Music). His yearly reports to the Trustees demonstrate his desire to provide his students with a broadly conceived art education. 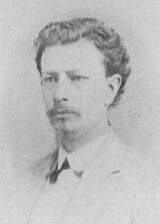 In 1878, he invited Professor J. L. Corning, a former Poughkeepsie resident and a student of the evolving field of art history, to deliver the first art history lectures at the college, initiating a series of lectures that moved the department beyond studio exercises toward the inclusion of art history and criticism. Van Ingen began to teach the course himself, lecturing on such topics as Gothic architecture, Renaissance architecture, paintings motifs, and “the Master Works.” In 1892-1893, with the dissolution of the School of Art, art became a regular course of study, and Van Ingen became the Professor of Art. Professor Van Ingen and a student in the Hall of Casts. Professor Van Ingen was popular with students. Upon taking in 1865 her first class with Van Ingen, student Ellen Williams wrote, “I think I shall like Mr. Van Ingen very much and he has so few scholars in each period that he can pay each of us quite a good deal of attention. He is a foreigner of some kind I think. He allows me to go right on from where I was, (I showed him one of my drawings which he said was very well done) and I am now drawing quite a large picture of the Goddess of Liberty.” Professor Van Ingen also often led excursions outside of the classroom so that students could paint in nature. He was also in charge of the budding Art Gallery. Supported by men such as founding trustee Elias Magoon, Van Ingen pushed not only for a fine collection of oils and works on paper, but also for a fine collection of plaster casts, which he used to teach art history as well as drawing. Despite his many duties, the creation of art remained the focus of Henry Van Ingen’s life. A letter to a Miss Grant outlines Van Ingen’s preferred way to teach drawing. Using common white paper and charcoal, he would draw a shape for his students to copy, explaining how it reacted to light and shadow, drawing and hatching all the while. This practical explanatory method differs little from that used in today's studio art classes. Van Ingen remained at Vassar for the rest of his life, taking occasional trips back to Europe. His eldest son followed his father in the teaching of art, becoming an instructor at Columbia. The Van Ingens lived in a small house near the campus and became integral parts of campus life. When, on 17 November 1898, Henry Van Ingen died of heart problems, his family remained in their college-owned house. The legacy of Professor Van Ingen is still alive at Vassar, in the curriculum and on the campus. In 1935, the Van Ingen Art Library was added onto Taylor Hall, and Van Ingen's fine landscapes remain part of the collection of the Frances Lehman Loeb Art Center. A bronze bust of the artist is often on display, along with other of his works. Letters from Old-Time Vassar: Written by a Student in 1869-1870. (Poughkeepsie: Vassar College, 1915), 17.